XAT 2020 is an important MBA entrance test leading to MBA admission 2020 in XLRI, SPJIMR, IMT, XIMB, TAPMI, XIME and other 150 MBA colleges in India. The expected XAT 2020 date is Sunday January 5, 2020. XLRI conducts XAT entrance exam in the month of January every year. After finalizing the XAT exam date, XLRI will announce the complete schedule and all XAT 2020 important dates in the month of August 2019. As the XAT is for admission to all the Xavier institutes, the XAT full form is Xavier Aptitude Test. XLRI will conduct XAT 2020 as a computer based test in a single session across the country. Xavier Aptitude Test (XAT exam full form) 2020 is one of the largest National level MBA entrance exams to which around one lakh candidates apply. Although XLRI will accept only XAT 2020 score, the other associated top MBA colleges will accept other exam scores also apart from XAT 2020 scores for MBA admission. XLRI has been conducting XAT entrance exam for more than 60 years. A new type of Numerical Answer Type Question (NAT Questions) has been introduced. XAT Exam: How to Apply? XAT 2020 Exam: How to Prepare? XAT exam information with XAT exam date, and other related XAT 2020 exam dates will be released on XAT 2020 website in the 2nd week of August 2019. XAT 2020 Notification containing XAT exam details, XAT exam format, XAT exam centres and all the XAT exam dates 2020 will be released in the leading news papers also. All the XAT 2020 exam dates with other information and FAQs will be available on XAT 2020 exam website. It is expected that around 1 lakh candidates will appear in XAT 2020 exam since the number of candidates going for XAT 2020 registration are expected to increase again. Over the years the candidates applying for Xavier Aptitude Test (XAT full form), have been increasing year after year as the data for past XAT exam registration also reveal this fact. XAT MBA entrance exam attracts the cream of talent in India. The best talent of country aspires for XAT accepting colleges. The admission to XLRI is possible only through high scores in XAT MBA entrance exam. Return on investment at XLRI is high. 2 years fee and other expenses at SPJIMR, XLRI come to around Rs.16 to 20 lakhs. Top recruiters from India and the world eye these institutes for their placement season. The offered salary packages go as high as Rs.25 to 35 lakhs per annum to the students of XLRI, SPJIMR, IMT among others who offer admission on the basis of XAT exam scores. XLRI conducts XAT on behalf of XAMI. XLRI believes that single testing session with same difficulty level will provide level playing field to all the XAT test takers without any discrimination. Around 90 thousand to 1 lakh candidates explore admission opportunities in XLRI and other member and associate MBA colleges accepting XAT scores. Xavier Aptitude Test (XAT full form) is the second largest MBA entrance test to pursue MBA/PGDM in 11 member institutes and 140 Associate institutes accepting XAT exam scores. Till 2017 XAT remained a paper based test. With effect from 2018, XAT has become an online computer based test. XLRI – the XAT 2019 exam conducting authority is expected to announce the XAT 2020 exam date as January 5, 2020. The XAT exam date will be same across the country. On a single XAT 2019 date, the exam will be held in 46 XAT test cities in India. However, the 2 cities abroad namely, Kathmandu and Dubai are no longer the XAT 2020 test cities. XAT is one of the oldest MBA entrance exams being held for last 60 years. Apart from XAT registration and filling up the XAT exam application, candidates need to apply separately to their preferred MBA colleges including XLRI, SPJIMR and others. XAT eligibility criteria 2020 for XLRI-XAT exam to be held on January 5, 2020, need only a pass in your bachelor’s degree while other exams need minimum 50 percent marks to apply for the exam. XAT 2020 eligibility is probably the simplest one among all the National Level MBA entrance exams. XAT Admit Card 2019 Download has begun at 9AM on December 22, 2018. The XAT Admit card 2019 download process can be completed from official XAT exam official website . Earlier XLRI had announced to release the XAT 2019 Admit Card at 5 PM on Dec 22 after postponing the XAT hall ticket release by two days. XAT 2020 Registration opens in the 3rd week of August 2019. The XAT 2020 registration last date for XAT online registration 2020 is November 30, 2019 without payment of late fee. With late fee, the XAT 2020 online registration last date is expected to close on December 9, 2019. Please note there is There is no offline process for XAT registration 2020. General Knowledge (GK) for XAT 2020 will be the 4th section in the exam. GK has become an important section now due to the fact that it is now an integral part of XAT exam 2020. In the changed XAT exam pattern, the 5th section on Essay Writing Test has been removed from XAT 2020 exam. So, alongwith other three sections, XAT GK questions will also play an important role in XAT 2020 online computer based test. Xavier Aptitude Test (XAT) 2020 will be conducted by XLRI Jamshedpur on behalf of XAMI on January 5, 2020 from 10AM to 1.00 PM in a single session. XAT 2020 Exam Pattern is the Online computer based test. XAT pattern 2020 reveals that it will be the third computer based test in the 60+ years history of XAT. Till 2017, XAT Exam Pattern remained a Paper Based Test. Selection procedure of XLRI-XAT 2019 is more governed by the admission policy of XLRI Jamshedpur and other 140 member and associate B-schools accepting XAT 2019 scores in their admission process. XAT 2019 score is the mandatory requirement in the XLRI selection process for its highly ranked PGDM programme. Xavier School of Management (XLRI) Jamshedpur will shortlist you on the basis of your XAT 2019 score immediately after the XAT 2019 result is declared in the last week of January 2019. 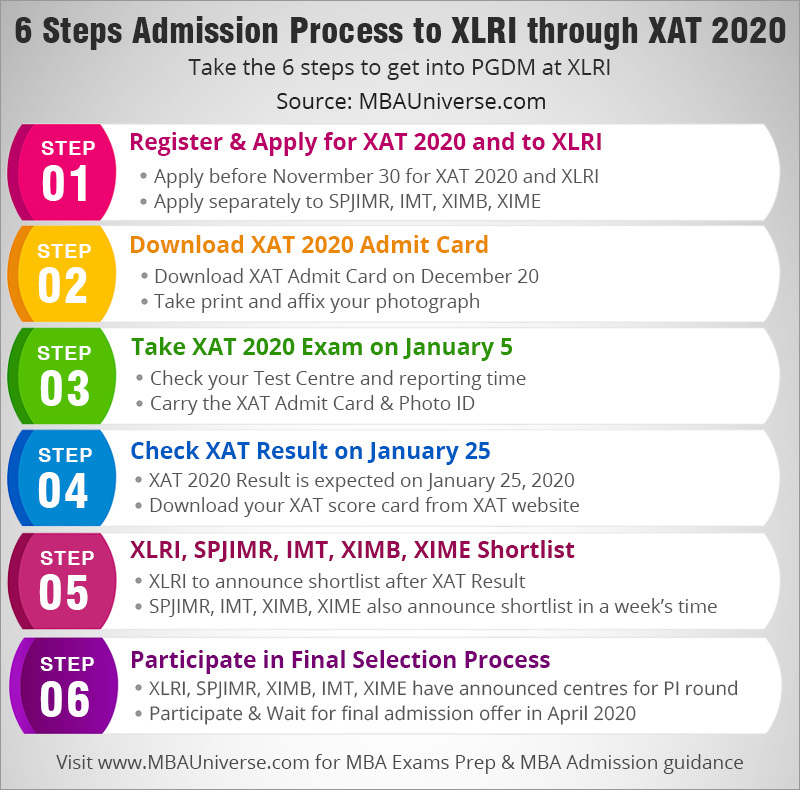 XAT Preparation 2020 for the XAT exam, to be conducted by XLRI Jamshedpur on January 5, 2020 as computer based test can get you admission in prestigious XLRI, SPJIMR, IMT, XIMB,TAPMI, XIME, BIMTECH among other top B-schools. It is high time that XAT 2020 preparation must be started without any further delay as per the revised XAT exam pattern. XAT Previous Year Papers are the best guide to prepare for the XAT question paper 2020. XLRI will release the XAT Previous Question Papers after the beginning of application process in August 2020 for XAT 2020 exam which will be held on January 5, 2020. XAT Result 2019 was released on January 16, 2019. You can login to XAT official website and download XAT Scorecard now. XAT Scorecard 2019 doesn’t include XAT Score but only XAT Percentage and XAT Percentile. XAT Result 2019 was released on late evening of January 16, 2019. XLRI has also released the XAT Shortlist of candidates for admission 2019 for different XLRI programmes. XLRI has deleted the Essay Writing Test section from XAT 2019 exam. It is possib le that the Essay Writing test in XAT may be reintroduced in 2020. The list of XAT essay topics for consists of XAT essay topics which appeared in past Essay writing tests in XAT. XAT Essay topics are mostly based on abstract ideas as appeared in past. The Essay Writing Test in XAT may be replaced b y Writing Ability Teast (WAT) in the final selection round by XLRI.